The Bissell ProHeat 2X line received a fresh new design recently that helped enlarge its water tank, lighten its overall weight, and otherwise bring it up to par with other modern carpet cleaners. On this page we review the newer Bissell ProHeat 2X Premier (Model 47A23), as well as look back at some of the older ProHeat 2X models to see how far the line has come and what is better today than it used to be. 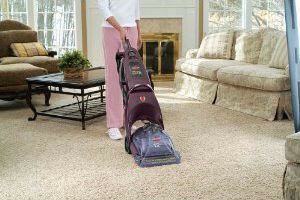 Bissell has long been known for making excellent carpet cleaners and steam cleaners. 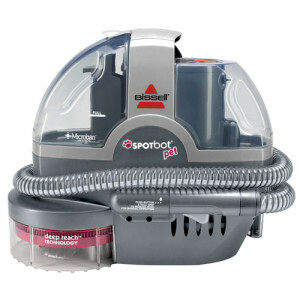 The are several different Bissell products on the market, including ones that are more specialized as pet cleaners, professional cleaners, and canister spot cleaners. 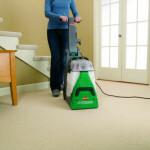 For a fuller overview of all of these different options please see our Bissell Carpet Cleaners page. The Bissell ProHeat 2X 9400 and 9500 are the two older Bissell carpet steam cleaners that used to be popular with consumers back in the mid-2000s. 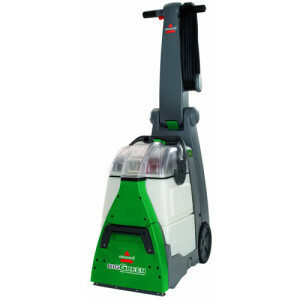 In more recent years Bissell came out with a triangular shaped design for their carpet cleaners that helped enlarge the water tank capacity from 1 gallon to 1.25 gallons while keeping the overall machine lighter. Because the carpet cleaner is skinnier around the handle in the new design it cuts down on unnecessary weight at the top of the machine, instead concentrating the weight down where it needs to be at the bottom with the water tank. Let’s dive into the new Bissell ProHeat 2X review and hopefully help you see if it’s the right carpet cleaner for your home. The ProHeat 2X Premier 47A23 model is consistently given some of Bissell’s highest reviews for any carpet cleaner model they’ve put out. 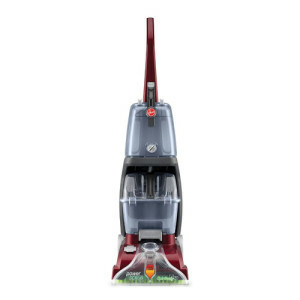 In fact, the only Bissell carpet cleaner that has a higher average customer rating on Amazon currently is their professional grade Big Deep Green Cleaning Machine that is nearly twice as expensive. In terms of bang for your buck, as long as you don’t need it for cleaning up after pets, the ProHeat 2X Premier is your best bet with Bissell. 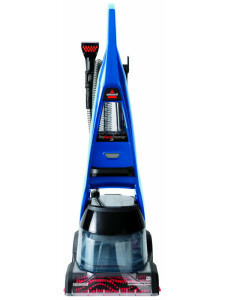 The 47A23 model features Bissell’s Heatwave Technology. The machine constantly heats the water in your fresh water tank, making it easier to extract the dirt and germs from your carpets in a hygienic way. 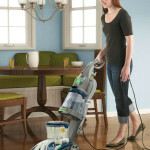 The cleaner uses exhaust air to help maintain a consistent hot temperature throughout your cleaning. 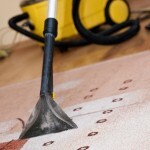 As a result, according to Bissell reps, there’s no way to turn this feature off, which you may want to do if you were cleaning up pet urine for example, as pet stains can set faster into the carpet with hot water. 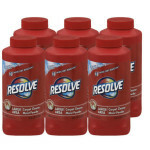 If you are interested in a pet cleaner anyway, you would do better looking at Bissell’s DeepClean Deluxe Pet Carpet Cleaner , as that model comes with a number of features to separate out pet hair and the extra gross stuff from your water tank, and it’s not much more expensive. Even though it has their Heatwave Technology, you still want to put at least warm water in the tank to help you get started. The feature keeps your water hot, but not scolding, so the temperature should be great for you if you start with already warm water. The ProHeat 2X Premier also has 10 rows of power brushes that are designed to loosen the dirt from deep inside the carpet. That helps you lift it away with the dirty water, which is suctioned up and kept in a separate tank from the clean water. 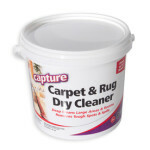 You may want to check with the manufacturer’s care instructions for your carpet type to ensure that brushes are not going to damage the thread of your carpet. This model has a seven amp motor that is powered by a twenty-two foot electric cord. 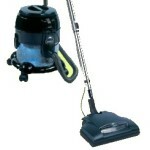 It is also suitable for cleaning upholstery and stairs, as it comes with a hose and tool especially for that. 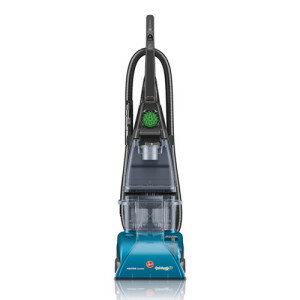 The ProHeat 2X Premier 47A23 has a twelve inch cleaning path, and comes with Bissell’s three-year limited warranty. One of the main complaints with Bissell’s water tank design is that although the clean and dirty water tanks are separate, they are in the same removable container. This makes it difficult or impossible to empty the dirty water tank without also emptying the clean water tank. 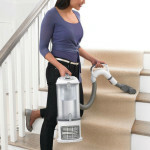 In addition, although the overall weight is significantly lower in Bissell’s new design, some customers complain that it actually seems harder to push. This may be because a higher percentage of the weight is concentrated in the very bottom of the machine, making it harder to get started. These are isolated complaints, so your mileage may vary, or you may prefer the fact that it is lighter to carry around overall. 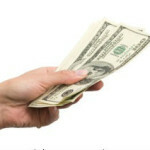 Some customers also note that your clean water and cleaning solution now go in the same tank, which means less things to troubleshoot if the machine malfunctions, but also means that you can’t simply switch to water only but will actually need to empty and refill your clean water tank in order to do so. Overall though, these handful of issues haven’t been enough to dissuade customers from loving the Bissell ProHeat 2X Premier 47A23, as over 70% of customer reviews on Amazon give it a full 5 stars. 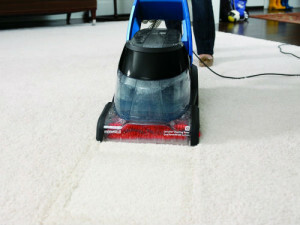 Bissell’s Dry Air feature which releases warm air through the bottom of the cleaner to help dry the carpet faster than ever before. Easy to assemble. While most reviewers did find that both the 9400 and 9500 were easy to assemble, the 9500 appears to be a little easier than the 9400 possibly because the instruction manual for the 9400 was not clearly written. Easy to take apart and clean. Most reviewers of both the 9400 and 9500 found that these machines were simple to take apart for cleaning. Easy to handle water tank. As one reviewer put it changing the water tank is like changing a vacuum bag with handles. On the 2X 9500 Bissell ProHeat carpet cleaner several reviewers were impressed with the clean shot feature and how it allowed them to put extra cleaner right in the places that needed it most. Almost all the reviewers also gave good marks to the on board heater stating that keeping the water hot helped to get the carpets even cleaner. 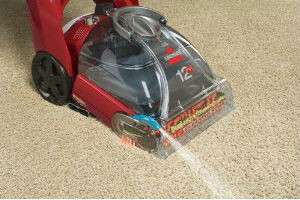 Several users mention that the plastic parts of these Bissell carpet steam cleaners would often break and need replacing. This problem seemed more prevalent in the 9400 than the 9500. Several users also stated that after several uses in many cases the brushes would no longer turn. Other users complained that the motors in the 9400 and 9500 would burn out right after the warranties wore out. 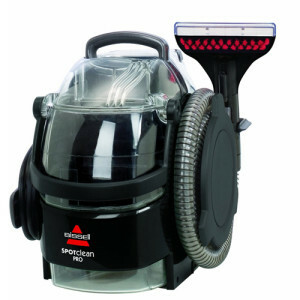 While the Bissell ProHeat 2X 9400 and 9500 both seem to be good machines that do an excellent job of steam cleaning everything they claim to clean and are well worth the sale price, there are some common problems in the ProHeat series of Bissell carpet steam cleaners that you should be aware of before purchasing. Many of the plastic parts do break sometimes after the machines have only been used once or twice. Replacements of these parts are fairly inexpensive but, can be annoying. However, when you consider the initial price of the machine and how well it cleans, one cannot expect all metal parts for such a low price. Another common problem with these Bissell steamers is the freezing of the brushes. 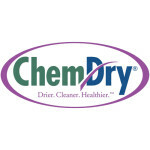 In most, cases cleaning after use may help eliminate or reduce this problem as animal hair and loose threads can bind the brushes stopping them from turning and putting excess pressure on the cleaners motor. The last common problem is that in some cases the motor of these cleaners seem to be burning out sooner than one would expect. While most people claim that this happens after a year and the warranty wears out, one would hope that the Bissell ProHeat carpet cleaner lasted a bit longer and in most cases they do. The best way to decide if a Bissell ProHeat 2X is for you is to read customer reviews available on these steam carpet cleaners before purchasing to see if any of the common issues will be a problem for you. You can find hundreds of these customer reviews here on Amazon.